Since I was, I don’t know, three, it’s taken me about an hour and a half to fall asleep at night. 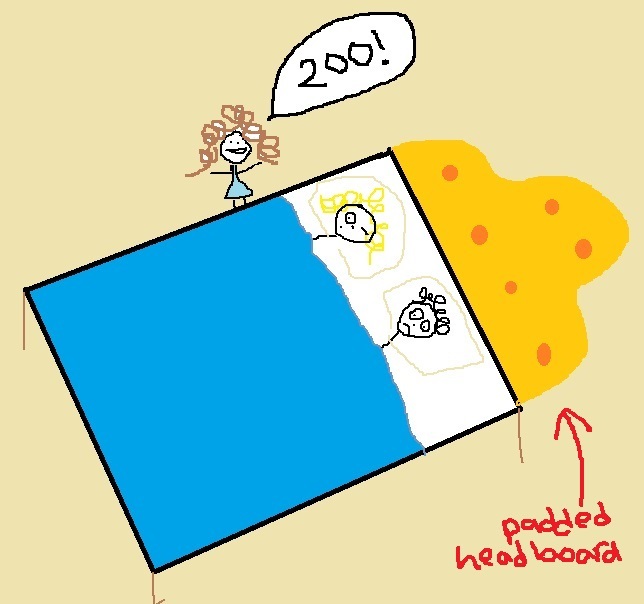 Once when I was five I actually counted to two hundred my head, then slipped out of bed to my parents’ room and woke them up to share the good news. “I just counted to two hundred!” I whispered. But two years ago, this changed. It started when I had a panic attack. My chest seized up and I lay wheezing on the couch telling Benson, “My breath hole! It’s…it’s all closed up!” Later, after I was able to inhale and exhale like a normally functioning human, I asked my therapist pal Annie for some help. “You know, just in theory,” I said, in order to not have to give her seventy dollars for being my friend/therapist. She told me about some breathing techniques to try, plus gave me some copies of this muscle relaxation exercise. “Clench your fists. Feel the tension in your fists. Relax your fists and let the tension go…” It was good stuff. It calmed me. The thing was, I wanted someone to read it to me so that I wouldn’t have to constantly scan my handout in the middle of trying to relax. So I YouTubed “progressive muscle relaxation” and found this really nice girl who takes you through the whole thing! I’d listen to it as I fell asleep, until I’d wake up because Benson was shaking the bed laughing so hard at the part where she tells you to squeeze your buttocks. It worked great for a while, but eventually I was back to lying awake for hours. I needed someone with an even more relaxing voice. I realized it wasn’t even the muscle relaxation that was relaxing me; rather, it was the girl’s voice. After a very sad Google search in which I learned Bob Ross died like twenty years ago (“He DIED? !”), I finally found some people who make YouTube videos specifically for folks like me. And it puts me in a total trance, people. I fall asleep instantly. It’s just like when I was six and I’d kind of loll off into a hazy happiness when the librarian would visit our class and read aloud to us. And it’s not just voices. It’s also the way someone moves. Like the ladies on QVC pointing out a porcelain doll’s earrings? Some teenagers smoked grass to get to sleep in high school; I watched QVC (well, and smoked grass). So when these YouTube people talk about their flea market necklace, and they point to the clasp at the top, I double melt. Unfortunately, Benson doesn’t really “melt” over these videos. He’s actually quite hostile toward them. “Ah, blech! Ugh – I can’t stand it. That whispering! Gah!” So I started sleeping in headphones. I was mildly concerned about the ear buds damaging my cochleas, but fought through in order to fall asleep within minutes instead of hours. Then, about a year ago, one of my favorite soft-spoken gals filmed an “unboxing” video where she slowly opened up a package. 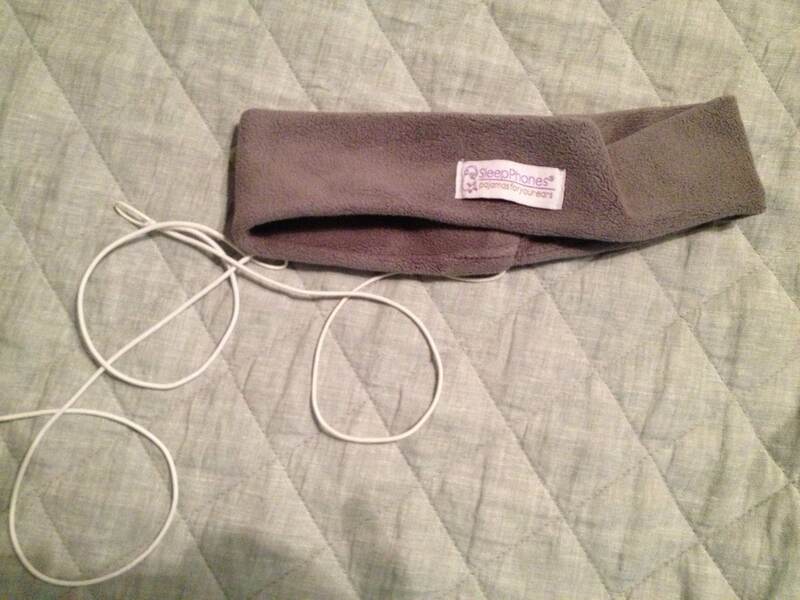 Inside was a fleece headband with earphones hidden inside. SleepPhones, they called it. After watching the unboxing video for seven nights straight because I loved the way she read the pamphlet that came with them, I ordered some. Occasionally I wake up strangled by the cord, but I always wake up before it kills me. And besides, even if you account for the lost sleep from nearly suffocating, I still get more sleep than when I was dabbling with insomnia. They did a story about this whole thing on NPR a while ago. It made me feel a little better that someone with a grownup job like working for NPR listens to these quack videos as well. It’s like I’m legit. Okay folks, you go find a less neurotic person’s blog to read, and I’m off to conquer the day (because I got some dang good sleep last night). The more we learn how weird you are, the more we like you. Everyone is weird/crazy in some way. Everyone. What’s different is you articulate it better than most. Love the way you worded that. 🙂 thank you. Oh my goodness, hilarious! I read this at work and had to quit and come back because I was laughing so hard people were wondering what I was doing! !